FT8 has been around for some time now. It was adopted fast by the amateur radio community and it is clear that FT8 overtook JT65 quickly. But is it an improvement? It has to be said that Franke and Taylor (FT) have done a tremendous job with the development of various weak signal modes and FT8 is certainly a valuable addition to the ‘line’ of JT modes. The author compared JT65 and FT8 in real world situations with fading, interference, static, overlapping stations and so on. One could also say that the aim was to try to compare the reliability of real world amateur radio transmission circuits. 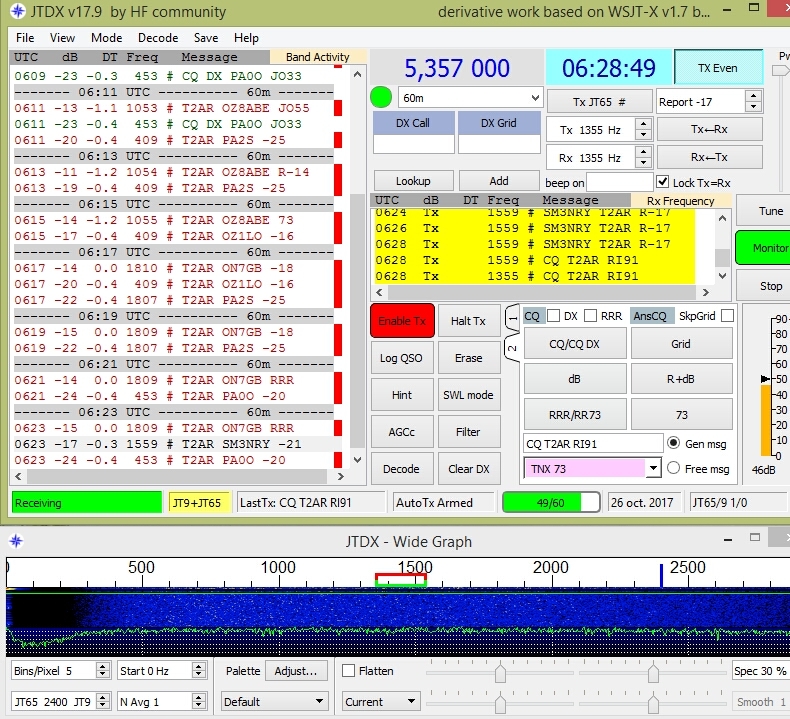 For the author, JT65 with JTDX has been the ultimate combination. Decoding up to -30 dB and very reliable under difficult conditions, like overlapping stations (JT65, FT8 and even PSK), multiple stations calling on the same frequency as well as other interference from various sources. Without JT65 it would not have been possible to contact stations like 5W1SA and 3D2AG on 60 metres with a modest setup and a challenging man made noise environment. But with FT8, signals below about -18 become unreliable. Lower values are seen, but it seems that the FT8 decoding threshold is more sensitive to QRM than JT65 which does not surprise, given the shorter transmissions. To establish the decoding margin, real world background noise on the 60 metre band was used. The signal from the antenna was fed to a combiner. The other input was connected to the transmitter via attenuators. The transverter output of an IC7600 was used, because the relatively low output level prevents unintended coupling between transmitter and receiver. The output of the combiner was connected to a receiver with a second computer with JTDX (for JT65) and WSJT-X for FT8. With a spectrum analyser, the noise level was measured in 3 kHz bandwidth and a JT65 or FT8 signal was injected at the same level. This resulted in (near) -1 reports for JT65 and FT8. After adding attenuation, the reports nicely tracked the added attenuation values within about 2 dB, confirming that the software reports the signal to noise ratio well. Two tests were conducted. One during evening hours with some static and man made noise from various ‘unlicensed’ transmitters. The second test was during daytime with less QRM thus effectively white noise. JT65 decodes to nearly -30 were seen, but below -25, the evening tests had lost decodes. The daytime results were better and stable up to -28 (with hinted decoding). The evening results with FT8 showed that decodes were lost below -18. Good decodes below -20 were rare. During the day, FT8 was stable up to -22. With one dB attenuation added, equivalent to -23, decodes were lost completely. The results confirm that FT8 is more sensitive to QRM. The test illustrates that the practical difference in sensitivity between FT8 and JT65 is roughly 6 dB even though the theoretical difference should be less. As said, with JT65, good contacts were made with weaker signals, even close to -30. On 60 metres, stable series of CQ’s from ZS stations were seen with about -27 dB and when taking the 6 dB difference into account, it would require FT8 to be stable at around -21 dB, which is clearly not the case. This illustrates that the 6 dB estimate is not far from the truth or maybe even a bit optimistic. 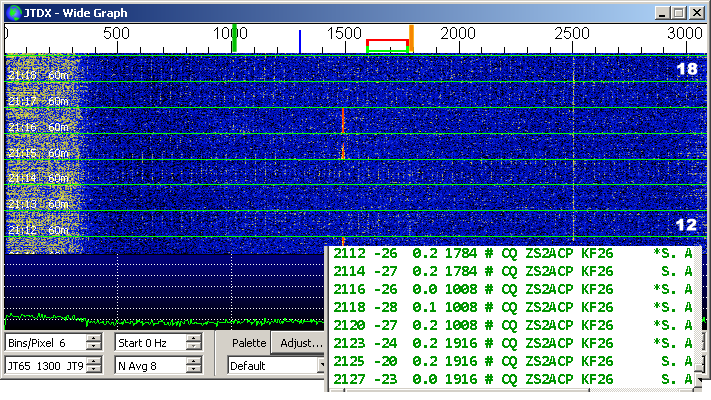 The picture shows CQs from ZS2ACP with QRM from over the horizon radar (OTHR, vertical lines). The green and orange markers indicate the sync tone of the transmissions. Incredible, how the software decodes so well, one can hardly see the traces! Having made numerous QSOs with JT65, it seems that fading affects JT65 less. Again, the longer transmissions are expected to be responsible for the better reliability. When talking about “user experience”, FT8 feels a bit nervous and does not leave much time to decide who to call on a busy band. The auto sequence feature is nice, but is also a drawback in the sense that working FT8 in auto mode does not require much from the operator and gets boring after some time. You want to operate your station and FT8 does not feel that way. With JT65, one could easily grab a coffee and such, because after the start of your transmission, you can leave the operating position alone for almost 2 minutes. After returning, time is left to see what was decoded and to decide on the next message. The operator is in charge and evaluates the proceedings. When FT8 runs smoothly, you can lean back until the final 73s, but if things go wrong, you can mess up an unattended QSO. The FT8 auto sequence mode with TX=RX on, sets the TX frequency to the remote station, but this is not always clever, because in busy situations, it can be beneficial to call/answer “split” on a clear frequency. Most stations decode the whole audio passband and will see your messages anyway. An important drawback is that stations who operate FT8 are unable to work JT65 at the same time. It is possible to run two instances of the software, but the different period duration is an obstacle. The lesser sensitivity of FT8 means that the weakest signals are lost, when switching from JT65 to FT8. In case a contact would be just possible with JT65, it will be missed with FT8. The screenshot above was received from 3D2AG, who was operating from Tuvalu as T2AR. Unfortunately, other stations came first and no QSO was made. T2AR was -25 dB at PA2S which would not have been possible with FT8. Reception at T2AR was better because of the lesser noise, but about -22 is simply not good enough for FT8. This is an example of opportunities that vanish if FT8 is used instead of JT65 (or similar modes of course). When looking at the path loss, 6 dB difference is a distance ratio of roughly 2. This implies that the range of FT8 is about half the range of JT65 (assuming equal power and noise). This is a very distinct disadvantage. The above mentioned findings compare well with the statements of the authors. The table on page 4 (part 2) of the QST articles states that the SNR thresholds for FT8 and JT65 are respectively -20 and -25 dB for non fading signals. These values are based on 50% decoding probability. The estimated 6 dB difference is confirmed by the authors, see page 5 of part 2, top left column. After using JTDX and WSJT-X for a while now, no differences in decoding margins are seen with FT8. Both applications perform more or less identical. But JTDX outperforms WSJT-X considerably with JT65 and JT9, especially with hinted (a priori) decoding and JT65 overlapping signals. The overall experience is that FT8 is rather disappointing when DX is the prime objective. Many DX opportunities are simply lost. It is very frustrating to see signals on the waterfall, without decodes. A final word about the auto sequence feature of FT8. If one calls CQ and have the “call 1st” checkbox ticked, the first decoded station will be answered. It is likely that the strongest signals will win. JTDX was very good at decoding overlapping signals and the writer often chose to reply to the weaker signal first in such cases. JT65 provided a fair chance to all callers. But the big guns win with FT8 and the small pistols will get frustrated. Unintended consequences? Finally, running your station more or less unattended with auto sequence is like a child playing with an electric toy. It can watch it for a time, but at some point, it gets boring and the toy ends up gathering dust in a corner of the room. It is hoped that JT65 (or maybe a slow version of FT8?) will revive after the frenzy is over.